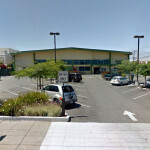 Lakeshore Partners has submitted plans for a 24-story building to rise on the parking lot at 2270 Broadway in Oakland. The existing “80 Grand” medical office building and parking lot on the south half of the block would remain in place. 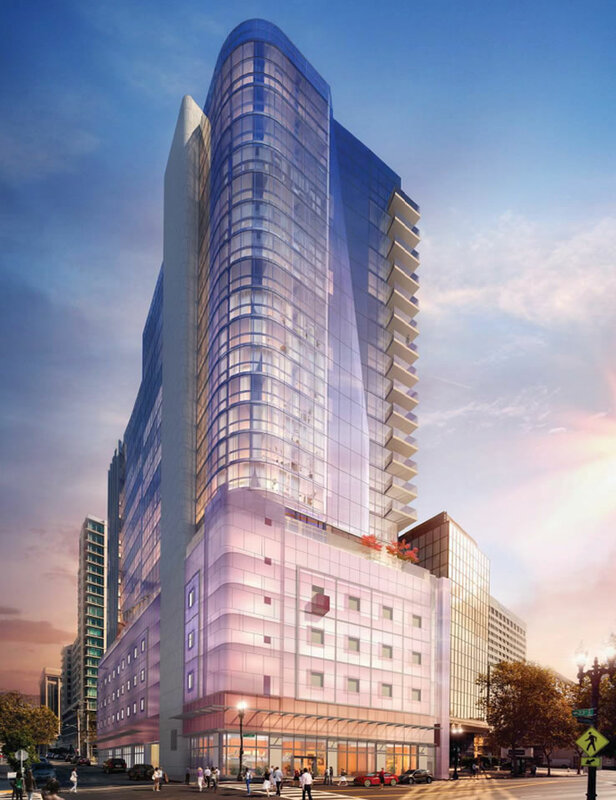 As designed by MBH Architects, the proposed building would rise to a height 289 feet and include 223 residential units, with up to 5,000 square feet of retail space along Broadway and 2,800 square feet of retail along 23rd Street. The residential units would range from an average of 510 square feet for a studio to 1,215 square feet for a two-bedroom, with two, 2,000-square-foot two-bedrooms on the 23rd and 24th floors of the building. Parking for 261 cars, including 35 spaces for the building’s retailers, would be provided in a garage which would span the first six levels of the building. The 2270 Broadway site had been envisioned for the development of an 8-story hotel under Oakland’s Broadway Valdez District Specific Plan (BVDSP) which was adopted last year. And as such, and noted by Tim Mulshine, the proposed project is positioned to forego a lengthy environmental review process and could be fast-tracked for development. If approved and financed, the project would take an estimated 24 months to construct. Hmm, still not seeing Downtown Oakland as a desirable place to live. Well, lots of people do, hence the new construction. Fortunately, your opinion is irrelevant! DT Oakland is probably one of the most vibrant places in the country, and centrally located. Still pretty expensive though. Ham, Downtown Oakland is dead most weeknights. Presumably more construction like this will change that, but don’t put the cart before the horse. Well the office sector of DT Oakland is quiet in the sense that SF’s FiDi is also relatively quiet. There’s plenty of nightlife though it is spread out and you need to know where to find it. Oakland has plenty of room to grow. 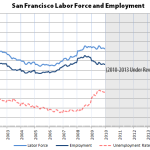 Every time SF pushes back on growth more opportunity opens up in the rest of the Bay Area. Agreed. It looks like a Las Vegas casino. I assume that’s two apts per floor and that they’re not all alone up there. great news for uptown. hopeful to see more developments coming on Broadway. It seems right now the money is on JLS to be the destination neighborhood, but with the 19th St BART i think Uptown is the more desirable location. I would much prefer Uptown to JLS myself in Oakland. I really liked Uptown when I spent some time working over there. Although people will live in anything, psst… redo — from bottom up. I think it looks cool… beats the blandos going up all over the Bay Area. Dittos. Nothing too bad here. They would prefer a beige box? Yep agree. It’s cool looking to me. I just think they need to have outdoor spaces for people. Who doesn’t love to garden, even on their balcony? People can grow tomatoes in Earth Boxes on balconies, and do. Sorta resembles Lumina. Not sure that’s a good thing. I wish it looked less like Infinity. Architecturally, the first six floors of parking un-do it for me. That’s the best facade the designer could pull off? As opposed to dank subterranean parking? Apartments above a parking podium is a great way to raise the residential units away from the street (height = less street noise and better views). Though not everyone will feel that a high floor is desirable. A lot of folks prefer to live closer to street level, even in highrises. Right, that’s why the lower floors in a hi-rise command a much higher price, right? I didn’t mean that lower floor units were valued more by the general market. What I meant that a segment of the market prefers lower floors. In particular some disabled and elderly people worry about evacuation from a high floor in an emergency when the elevators are out. I look forward to the day when downtown Oakland has a building or buildings for that matter taller than 28 stories. Is the proximity to the Oakland airport been a hindrance, like in San Diego? No, 30+ and 40+ story structures have been proposed and approved on sites across downtown. I don’t see why Oakland needs this. i look at this parking lot from my office. was just talking about the lot and wondering how long it would be before it got developed. love this idea. Start building tomorrow, Oakland zoning is just going to slow progress. Excellent location. Will block the views from the 10 year old condos across the street (but oh well). Only two short blocks to the 19th St. BART station and close to lots of Uptown nightlife. Lake is just down Grand! The architectural firm did a decent job with Broadway Grand. The loss of natural light will be a bummer for anyone living nearby, but it’s not unprecedented (The Grand at 22 stories). It would be nice if the development included condos as a means of reducing turnover, but I think it’s an improvement over that vacant lot. it is an improvement over the lot and i do agree with you, but not sure it’s really “vacant” since somebody is making some money using it as a parking lot. The cultural destruction of Oakland is nearly complete. Now you can have all the pathetic joys of a Walnut Creek life is close proximity to people starving to death! Are there really people starving to death in Oakland anywhere in the USA? people die from malnutrition in the US every day. It is one of the CDC mortality categories. I don’t think “starve to death” is a clinical term that would appear in their statistics. if you work here its a greaaaaaaat idea…callsocket workers can live right in the town and work more hours..